Learning Abroad is committed to ensuring the health and safety of all our Coogs Abroad. To report incidents that occur during programs abroad. Note that this is for UH reporting. Incidents that should be reported to program providers or host institutions must be reported separately. CISI Insurance - UH has partnered with CISI to offer the most cost-effective and robust international insurance package available to our students and faculty leaders. Pre-Departure Orientations for affiliated, non-affiliated, and exchange programs are held each semester and attendance is mandatory for all students traveling abroad. Faculty leaders schedule orientations for their individual groups with the support of Learning Abroad. For the dates of this semester's Pre-Dpearture Orientations, please see the Events and Outreach page. UH Student Travel Policy - UH has developed this policy for international activities in countries for which the U.S. Department of State has issued travel advisories of Level 3 and Level 4. Students, faculty, and staff will need to consult the policy for specific details before making arrangements for university-sponsored travel. Student Travel Authorization Request Form (non UH sponsored travel) - The University of Houston (UH) does not allow university-sponsored, organized, or affiliated student travel to Level 3 (“Reconsider Travel”) destinations unless authorization is granted by the Vice Provost for UH Global. Travel Policy Acknowledgement for University Sponsored and/or Organized Travel - This form is required for UH students who choose to participate in a University Sponsored and/or Organized Learning Abroad program that takes place in a location with a Level 3 ("Reconsider Travel") Travel Advisory issued by the U.S. Department of State for which authorization has been granted by the Senior Vice President for Academic Affairs and Provost. University Sponsored and/or Organized Travel Authorization Request Form - The University of Houston (UH) does not allow University sponsored and/or organized Programs Abroad to Level 3 (“Reconsider Travel”) destinations unless authorization is granted by the Senior Vice President for Academic Affairs and Provost. University sponsored and/or organized travel is travel which is led by a University employee or for which academic credit is awarded, or any other travel administered by, conducted under the direction of, or with financial support from, any University department, program, or office. Travel Alerts and Warnings - Up-to-date alerts and warnings for U.S. travelers who are or will be traveling abroad. Visit the U.S. Embassy website for a complete list of U.S. Embassy and U.S. Consulate locations throughout the world. Keep in mind that, depending on the emergency, it may be best to shelter in place. Please visit the Travel Alerts and Warnings page to see if there are instructions in the event of an emergency. 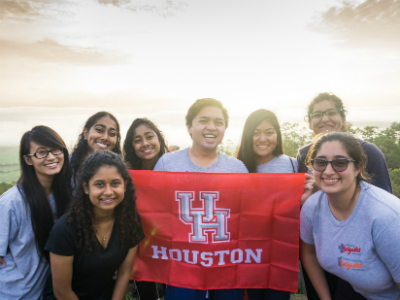 The Learning Abroad Risk and Safety Committee was established in January 2017 to develop guidelines and policies related to the health and safety of University of Houston students traveling abroad. For more information about the Learning Abroad Risk & Safety Committee, please contact Kelly Kleinkort, Director of Learning Abroad, at kmkleinkort@uh.edu.